The S&P 500 is 13 weeks into the current weekly cycle, it is pressing against the yearly resistance level 1 around 2850. 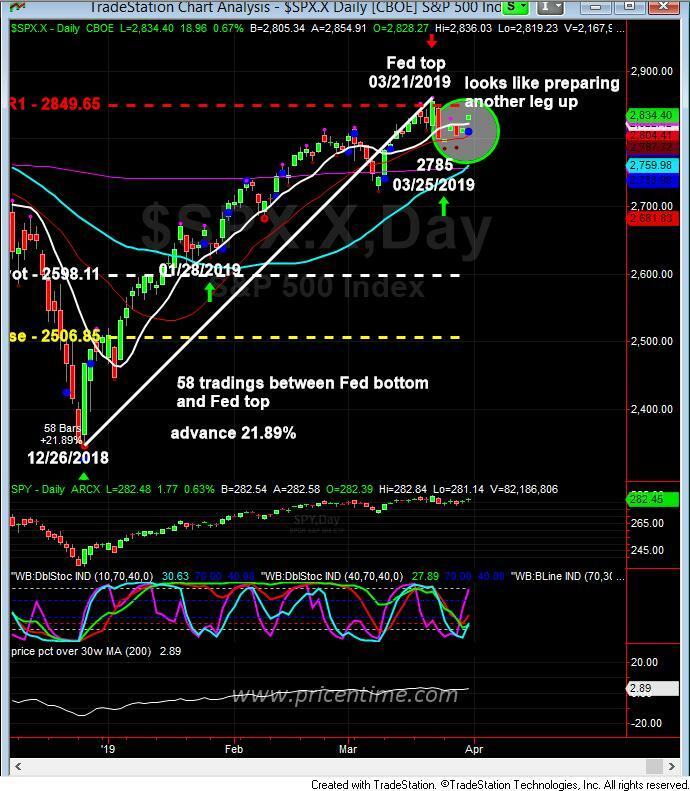 But the daily chart has finished a bottoming process last Friday by closing above the high of 03/26/2019 at 2830. The S&P 500 chart looks as if it can get another leg up. But we looked at the sectors within the broad market, the defensive sectors such as utilities and consumer staples are leading the index, the more economically sensitive sector such as the semi-conductor didn’t produce a buy signal last Friday, which means the leading sector is NOT leading at the moment. The bond market’s rally signals the risk off trade, investors are piling into bonds to avoid risk assets. All these are pointing to the fact that the market is indeed in a topping condition, the stalled selling pressure doesn’t mean the top is not valid. It just simply means the market needs a little more time to gather its energy before a correction happens. Last Friday, the White House economic advisor Larry Kudlow said he wanted the Fed to cut its overnight lending rate by 50 basis points “immediately.” Did the White House know something that we don’t know??? It’s very likely that the Fed and the White House know more about the slow down in Europe and China than the investing community. They wanted to do something preemptively to protect the US from being dragged by the overseas slowing down conditions. The Brexit turmoil certainly could add additional force to fuel a correction that is much needed in order for the market to continue the 4-year cycle that started in December 2018. All factors considered, we feel strongly that it’s best to wait for the market to fully play out the weekly cycle top, even though the market might still have the potential to move up 1-2% from the current price level. The reward of committing fresh capital at the current price level is too small considering the market can easily suffer a 10% correction at a moment’s notice. Historically, the first weekly cycle out of the 4-year cycle bottom normally produces a sizable correction because the market is never sure about bottoms. Bottoms normally are tested, it might not able to produce an exact same bottom, but certainly it will try to test it. In the testing process, it will produce a higher low or sometimes a lower low. Patience is a virtue, especially so when dealing with money in the market. This entry was posted	on Sunday, March 31st, 2019 at 5:24 pm	and is filed under Forecasts, Stock Indices, Uncategorized. You can follow any responses to this entry through the RSS 2.0 feed. Both comments and pings are currently closed.